Is the BOMARC an airplane or a rocket? If it is an airplane, then it is the pilotless type (aka 'drone'). If it is a rocket, then it is the ultimate in controlled trajectory hardware - at least in its day. The DoD referred to it as a surface-to-air guided missile. The name is a combination of 'BOeing Airplane Company' and 'Michigan Aeronautical Research Center.' Clever, non? If memory serves me correctly (it's been 30+ years), the AN/TPX-42 IFF (Identification Friend or Foe) secondary radar system (built by Gilfillan) I maintained as an air traffic control radar technician reserved a special 'X' bit in its data packet to designate the BOMARC - and maybe other guided missiles. That might have been a military secret at the time, because the Air Force instructors acted like they were divulging proprietary information when discussing why that bit was present in an otherwise generic data stream. Yo, Don H. and other retired radar techs: Do I recall correctly? Is there anything you would like to add? In this day of missiles, identification by popular names rather than type numbers is widespread, as in the case of "Thor" and "Atlas." Not all of the names, however, are chosen because they symbolize the power or the purpose of the missile. "BOMARC," a coined word, is simply a combination of the names of the originators of the Air Force's newest weapon system, the IM-99 interceptor missile, developed by the Boeing Airplane Company and the Michigan Aeronautical Research Center. Bomarc's buddies in North American Air Defense Command include RCAF's FC-100 (far left) and USAF F-102. Use of names instead of numbers for military aircraft is not new, some popular names having been applied in addition to the symbolic military type and model designations since the 1920's. One of the earliest examples was the name "Hawk," which was given to a long line of related Curtiss military, naval, and civilian planes. The practice was more or less unofficial before WW-II, but during the war years it was encouraged by the Government both as a guide to aircraft recognition by civilians and as a security measure designed to hide the development status of any particular design from the enemy. "Lightning" was applied to all Lockheed P-38's, for example, rather than resorting to such detailed identification as P-38L-5. Modem missiles are referred to almost exclusively by official and unofficial sources alike by names rather than by numbers. GAPA Beginning. Boeing's experience in the missile field goes back to 1945, when a small group was assigned the task of developing a rocket-powered anti-aircraft missile. In the absence of an official type designation, this was called the "GAPA," an abbreviation of the name Ground-to-Air Pilotless Aircraft. Altogether, 112 of these guided interceptor rockets were built and fired before the Air Force cancelled further development in 1949 because of conflict with other short-range missile programs that had been put under the jurisdiction of the Army. Boeing, meanwhile, had applied its accumulated GAPA experience to the preliminary design of a larger missile that could seek out and destroy invading aircraft hundreds of miles from the target in the manner of a long-range fighter plane instead of merely defending the target itself as a rocket-powered guided anti-aircraft shell. B Meets ARC/UM. Boeing was concerned primarily with the missile itself, which was only one part of the overall "Weapon System" that must involve detecting, launching, and guidance as well as the "bird" that carries the warhead to the target. 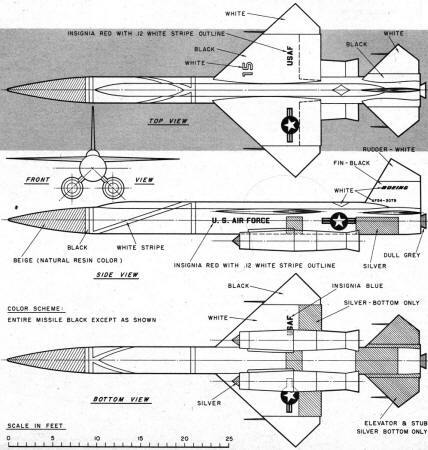 During discussions of the overall problem at Wright Field following cancellation of the GAPA Project, Boeing engineers were advised by Air Materiel Command personnel that the Aeronautical Research Center at the University of Michigan had been working on the guidance system for just such a missile. It was suggested that the Boeing and Michigan people combine their efforts and come up with a joint proposal for an entirely new and complete weapons system. Result was a pilotless interceptor airplane that could carry an atomic warhead to meet an invading bomber five hundred miles away. 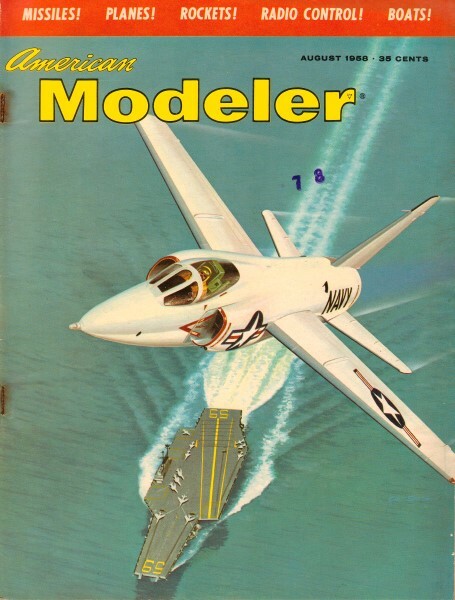 When the developmental contract was let in January, 1951, the new interceptor was given the standard fighter designation of F-99, for, in keeping with the concepts prevailing at the time, no distinction was made between manned and remotely-controlled aircraft. The choice was not illogical, since Bomarc possessed practically all of the characteristics of a normal airplane - wings, fuselage, tail surfaces, and power plant. Only the landing gear and pilot were missing. Remote-control airplanes were nothing new either. Obsolescent service types and specially-built drones had been used as radio-controlled target planes for years, and the change to liquid-rocket boost and ramjet power was a less radical change from standard jet propulsion than the change from propellers to jets had been. However, the different operational concept of the new weapon system soon caused the F-99 to be reclassified as an "Interceptor Missile" under the designation of IM-99 at the same time that the pilotless Martin. B-61 "Matador" bomber was redesignated TM-61 for "Tactical Missile." Bomarced F-94! First firing of the new missile took place on September 10, 1952, at the now-famous Cape Canaveral site in Florida even though Bomarc was not complete at the time. The two Marquardt ramjets and' the guidance system were not installed since the purpose of the firing was merely to test the rocket motor and the basic aerodynamic characteristics that had been developed as a result of wind tunnel tests. Separate testing of the guidance system took an interesting form - instead of losing the complete and very expensive test vehicle after each flight as was the inevitable result of most missile testing, a Bomarc nose section containing the missile guidance system was built into the nose of an Air Force Lockheed F-94 "Starfire" jet. The guidance system was then hooked into the Pilot Direction Indicator on the instrument panel of the F-94, and the accuracy of the system was measured by observation of the course that the F-94 took while the pilot was following the course given by his instrument. In this way, malfunctions that would have sent an unmanned missile far off course could be detected and the causes analyzed after the test vehicle was brought back to the home field after the test. If all worked properly, the F-94 followed a collision course toward the target airplane, usually a conventional piloted airplane when used in conjunction with the F-94 instead of being a radio-controlled drone (usually an obsolescent B-17) when used with the missile itself. The pilot was advised of his position relative to the target by ground radar, and knew without seeing the target through his windshield when to change course to avoid a collision. While Bomarc missiles were launched to intercept targets on inbound courses and generally approached them head-on or at least from a forward angle, the F-94 frequently closed on the target from the rear to reduce the terrific closing speeds produced by head-on approaches and increase the time available for system evaluation during the approach. The F-94 served in this capacity for nearly three years before being replaced by a Martin B-57B fitted with a similar Bomarc nose. Initial Flight. First successful flight with ramjet power was made on February 21, 1955. Since ramjets won't work at low airspeeds, Bomarc is launched and brought to nearly supersonic speed by an Aerojet liquid-fuel rocket built into the tail. By the time the rocket fuel is almost expended, the missile has sufficient speed to permit the two ramjets to operate. These ramjets, mounted on pylons projecting from the fuselage, continue to accelerate the IM-99 far into the supersonic range for the remainder of its flight to the target. Prior to the launching, information relative to the speed, course, and altitude of the target are automatically fed, or "programmed," into the Bomarc's guidance system. Following the launching, the missile is guided by ground control to the area where the preliminary calculations show that the target is expected to be. As it approaches the target area, the guidance system in the nose takes over, disregarding further ground instructions, and the bird is strictly on its own. While an operational missile does not need to score a direct hit on a target in order to destroy it, the guidance system was so accurate that a number of the target airplanes were destroyed by direct hits on the fuselage or by very close misses that nicked a wingtip. The hits were unintentional, as the missile was required only to come close enough to the target to be able to destroy it by the blast of the warhead touched off by a proximity fuse. No actual warheads were used during the testing. While the hits and-near-misses contributed to a spectacular record for accuracy, they hampered the test program by reducing the supply of obsolete but still costly target airplanes and destroying the photographic records obtained by automatic cameras aboard the targets. The maneuverability of Bomarc is remarkable, enabling it to change course more rapidly than an invading bomber taking evasive action. Once the target-seeking system has "locked-on" to the target, the missile is guided through changes of course as though by a human hand, but at much greater speed, thanks to the unique form of the controls. Instead of the standard ailerons, elevators, and rudder of the conventional' airplane, the IM-99 utilizes full-floating tips on each surface, now called "Tip-Type" controls. This system is by no means new, having been tried before and during WW-I and used on a number of gliders in the between-wars years. The main disadvantage of this type of control for piloted aircraft was the lack of "feel" for the pilot, who could easily overcontrol at high speeds and overstress his plane. Another problem, especially on the glider, was flutter resulting from necessary play in the control system. Boeing licked the flutter, and with an electronic instead of a human pilot, the "feel" was no longer a problem. Overstressing the aircraft through full displacement of the powerful controls at high speed was not a problem for the missile either, since it was built to withstand loads far in excess of those that could be tolerated by a human pilot. Specifications. In size, the IM-99 approximates a small piloted fighter such as the Lockheed F-104. Wingspan is 18' 2", the length is 47' 4" and the gross weight, including warhead, is approximately 15,000 pounds. 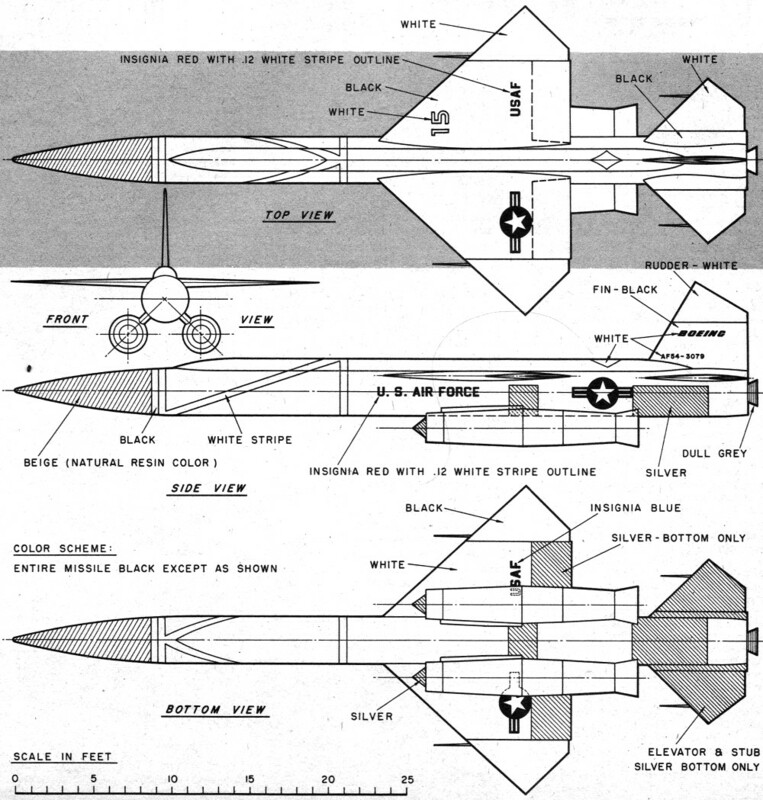 In spite of being a missile, the IM-99 carries standard aircraft markings and serial numbers as shown in Jim Morrow's drawing. This practice is standard for all Air Force "airplane" type missiles such as the TM-61 "Matador" and the SM-62 "Snark." The IM-99 was ordered into production after nearly five years of intensive testing and development. An initial order of $7,109,195 was placed on May 6, 1957, and was· increased by $139,315,444 in August. Thanks to production experience gained with the numerous prototype and test models, Boeing was able to deliver the first production model to the Air Defense Command on December 30 of the same year and launch a new era in the history of military aviation.